The design of Philips HD9220/26 AirFryer is appealing, compact and glossy. Its design is surprisingly compact on the worktop as it is tall and thin rather than wide like rotary health fryers. 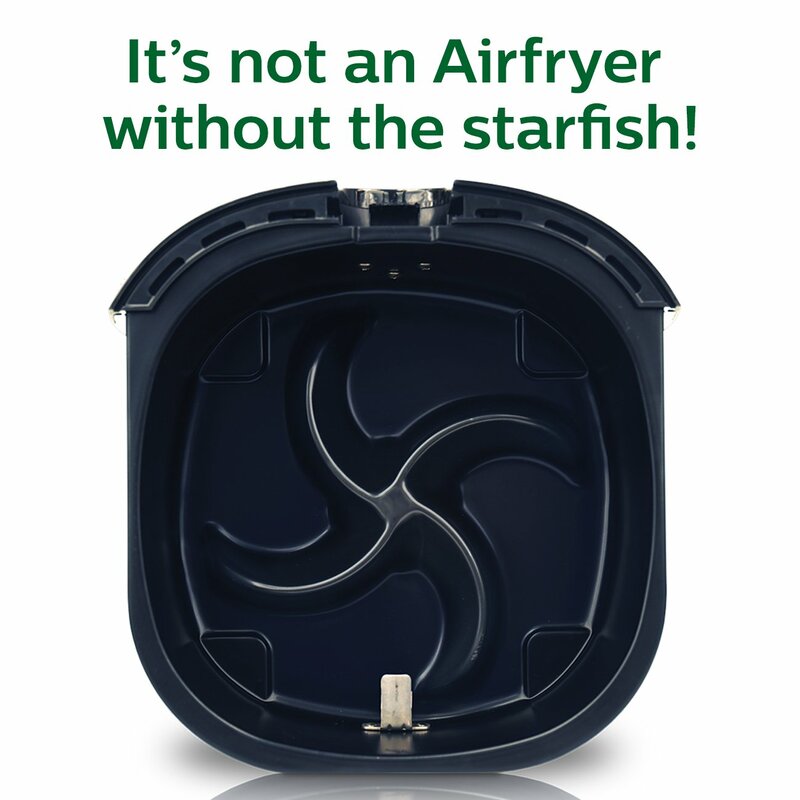 In the top section of airfryer has a heating element and fan, while the bottom section of the Air Fryer has a starfish design which facilitates airflow and ensures that all your favorite fried items are cooked evenly. This starfish design also helps to cook foods in a quicker and healthier way, with one tablespoon of oil. Philips HD9220/26 airfryer has an adjustable temperature control system which allows to set temperature up to 390 degrees Fahrenheit to cook varieties of items. It has the maximum 30-minute timer which gives the auto signal when cooking is completed and after that shut off automatically. So you get exactly cooked food without spending lots of time in your kitchen. Its Rapid Air Technology spreads hot air with high pressure so that cooking has become faster and used less or no oil. This product can be used for multi-purpose, such as fry, bake, grill and roast. All removable and dishwasher safe parts of this product make it easier to clean easily and quickly. Cooking basket capacity of this airfryer is 1.8lbs. Without changing the taste of frying it cooks 75% less fatty foods. When you buy Philips HD9220/26 airfryer, at first you have to remove all stickers and packaging materials. Then clean the whole basket and pan by scourer using hot water and liquid dishwasher. Before the starting of cooking in airfryer joint all the parts according to the directions. Then place this appliance on horizontal surfaces, but keep in mind that do not put it on the non-heat resistant surfaces. Then pull out the cord from cord storage compartment on the airfryer ground. Insert the power plug in the socket and pull out the pan from the airfryer carefully and put all ingredients in the basket. But be careful about the maximum amount indication of the pan. Finally, enter the pan into the airfryer and start cooking by setting required temperature and time using temperature control knob and timer knob. Before setting time be sure about the actual time of cooking particular ingredients. Keep in mind that you have to add more 3 minutes if airfryer is cold. You can also preheat this appliance before putting the ingredients in the basket. Whereas Philips HD9220/26 airfryer is an expensive appliance in your kitchen, so you should ensure proper maintenance of it. After every use, the pan and basket must be cleaned properly using the dishwasher and the surface of this appliance should be cleaned thoroughly by a wet cloth. If your airfryer become so much dirty, you should use a solution of 3 g Baking powder with 100 ml water. To clean airfryer using this solution follow the direction carefully. First of all, you have to remove the pan and basket from the drawer and flip over the airfryer. Then spray baking powder solution on the dirty area of the heater and wait for 30 minutes. Again flip over the airfryer, spray solution around it and wait once again for 30 minutes. After 30 minutes put back the pan and basket into the airfryer and fill up the pan with 400 ml water to make the dirt smooth. Then set 200 degree Celsius temperature for 20 minutes. Again take out the pan and basket from the drawer and let it put for cooling down until it becomes slightly warm. Then flip over the airfryer and take a sponge or cloth to wipe up all the dirt. Finally keep it at a dry place and wait until it becomes totally dry. As it is a kitchen appliance, so hygiene is the most important fact. For this reason, to cook food hygienically you should ensure the proper maintenance and cleanliness of this equipment. Philips HD9220/26 AirFryer has made of reflecting the issue of providing complete satisfaction to the customers. When you use this kitchen appliance, there is no chance of getting unevenly cooked food as it has timer and auto shut-off system. After setting up the cooking time, you can go to another work without any kind of worries that food will be overcooked. Its automatic shut-off system turns off after cooking. In the time of making fried items we feel disturbed to use hot oil because of splattering of it. But when you using this airfryer you become totally tension free since the pan contains the hot oil into the airfryer. Philips gives One Year Limited Warranty from the date of purchase of this product. Warranty valid only if the product stands free from defects in material, structure and assembly, under ordinary use, according to the specifications and warnings described in the manual. This warranty is non-transferable, extends only to the original purchaser of the product. To get your rights under this warranty, you have to show the original sales receipt indicating the product name and the date of purchase to prove the purchase. For warranty support services, please visit www.philips.com/support. Gives excellent results in making deep fried foods. Easy to use and fast to cook. Works much better than an oven for producing a crispy outer crust. Doesn’t make the house smell of old grease. Simple to understand and operate. Needs a little or no oil to cook. Helps to defrost the frozen food. All of its parts are removable so it is easy to clean. Without compromising on the texture and taste of the food, it reduces calories. Quite large to carry but cooking capacity is not so large. Baking tray and Double layer rack are not given with the pack. The middle class can’t afford to buy this expensive product. There is no off button to switch off it after setting the timer. When the timer is set up to less than 5 minutes, the timer does not beep after completion of the certain time. Many other accessories are needed to get the best performance from it. 1.What kind of baking pot, can I use in the airfryer? Answer: You can use any kind of pot made of glass, ceramic, metal or silicone which maximum size can be 6 x 6 x 2.95 inches (L x W x H) on the outer edges. 2. What kind of foods the airfryer can cook? Answer: It can give foods a crispy outer layer while keeping the inside of it soft. As a result, your snacks become more tasty & crispy. 3. 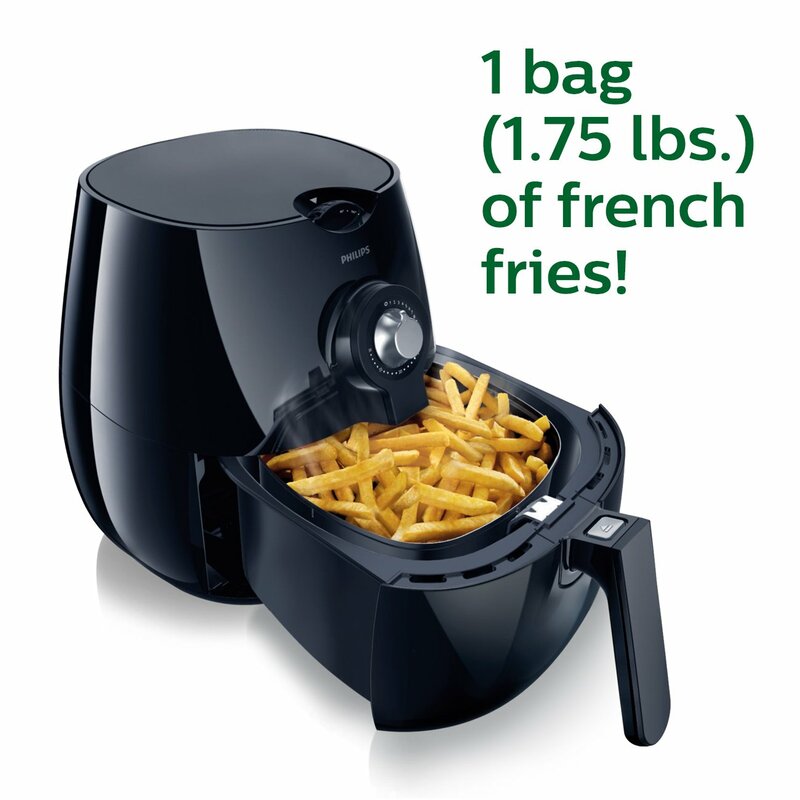 Can Phillips HD9220/26 AirFryer be used only at 110~120 v? 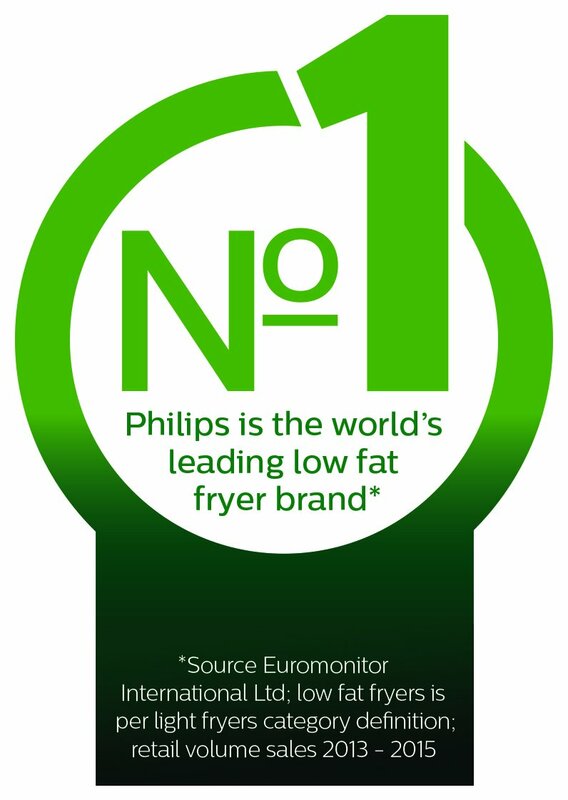 Answer: Phillips HD9220/26 AirFryer is made of 110 v for USA market and 220 v for the European market. 4. Is it possible to use aluminum foil or baking paper in the airfryer? Answer: Yes, It is possible to use aluminum foil in the airfryer. But you have to ensure sufficient space to let the air stream around the food. In the airfryer, you can also use baking paper with the baking pot but keep in mind that it should not come out beyond the basket edge. 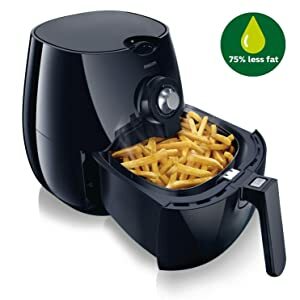 Philips HD9220/26 AirFryer is highly recommended for health conscious people since it cooks foods using less or no oil without changing the food’s taste and texture. This appliance also helps you to get some free time in your busy life by cooking your foods easily and quickly. So just buy a Philips HD9220/26 AirFryer and enjoy the taste of your favorite snacks within a moment.